(EDITORS NOTE: . When Israel came into existence in 1948 it had to create an administrative and judicial system for a population that would be quickly swollen by people arriving with virtually nothing. Those responsible for its design came from an Ashkenazi (East European) background, strong democratic ideals and a desire to create an electoral system that could not lead to dictatorship or another Hitler gaining power. They applied proportional representation viewing the country as a single constituency. Elected members are chosen from a closed-list put forward by each party The more votes given to a party the more seats they receive. This is called ‘The D’Hondt Method’. Thus votes are for a party and not a candidate. The Knesset (parliament) has 120 seats. These were the first elections held in Israel, and as such they demanded special preparations. On 5 November 1948 the Provisional State Council decided that the Constituent Assembly would consist of 120 members. On 8 November 1948 a population census was held which was later used in part for the preparations of the voters guide (the census was essential due to the rise of new immigrants and many Arab inhabitants of the British Mandate became refugees after the war). For the purpose of the census the entire country was under curfew for seven hours, from five in the afternoon and until midnight. Another issue was the form the Electoral System should take. Suggestions were made of different Electoral Systems. Eventually it was decided to maintain the relative electoral system which existed in the elections for the Assembly of Representatives of the Jewish community in British controlled Palestine. The Constituent Assembly elected would determine the future electoral system in Israel. A thousand polling stations were prepared across the country. According to census, the number of eligible voters consisted of half a million people. The second government of Israel was formed during the first Knesset. David Ben-Gurion made an attempt to form a minority government consisting of Mapai and Sephardim and Oriental Communities on 17 October, but it was not approved by the Knesset. Two days later President Chaim Weizmann asked Progressive Party leader Pinchas Rosen to form a government, but it was Ben-Gurion who finally managed to do so on 1 November 1950. The coalition partners were the same as in the first government: Mapai, the United Religious Front, the Progressive Party, the Sephardim and Oriental Communities and the Democratic List of Nazareth. How does the election system work, who is allowed to vote, and how is the next prime minister chosen: Everything you wanted to know about the Israeli electoral system but were afraid to ask. Between the spins, the political mergers, and the many candidates vying for a spot in the next Knesset – Israel’s legislature – it’s easy to get lost in the details. The Israeli electoral system is far from simple or intuitive; its structure will dictate how the elections will play out and shape the identity of the next government. To guide you through the political forest that is the 2015 March election, Ynet has put together a simple – but thorough – explainer. Unlike the US, Israelis vote for parties but do not directly determine which politician will head the next government. Instead, voters cast a ballot for one party, and the faction with the most votes gets a chance to form the next ruling coalitions. Essentially, the elections for the government are actually a vote for who will sit in the 20th Knesset – a 120-person body of MKs. The Israeli system differs in one other central way – the entire country functions as a single district. Unlike the British parliament, on which Israel's founding fathers modeled the nascant state's legislature, all 120 seats in the Knesset are elected through a national process – much like a US senator must campaign across his state. Each party puts forward a list of candidates, and the number of seats that each party receives in the Knesset is proportional to the number of votes received: A party that won 15 percent of the general vote will hold 15 percent of the seats in the Knesset seats. The candidates of any given list are elected to the Knesset based on the order in which they appear – the higher up the list, the greater the candidate's chance of recieving a Knesset seat. The result is a multi-party system considered to be highly representative – as each citizen has a wide array of parties to choose from, some with only nuanced ideological differences between them. However, this tends to result in highly unstable governments comprising a large number of relatively small parties. The excess votes for each party – ballots which do not translate into a whole Knesset seat – are "donated" by smaller parties to their larger allies as part of what is called a "surplus-vote agreement." For example, in the last elections, all excess votes for Bayit Yehudi were given to the Likud and a similar deal between the two will exist during the upcoming election as well. This method is known around the world as the Hagenbach-Bischoff method (in Israel the Bader-Ofer method) and is an attempt to strengthen political blocs at the expense of smaller parties. Thus, when a voter casts his ballot, it is important for him to be aware of the surplus deal the party has signed – as their vote might end up contributing to a different party's success. At times, surplus deals can lead to conflicting political arrangements. For example, during the last election, the left-wing Labor signed such a deal with the centrist Yesh Atid in the hopes of strengthening what they thought would be a center-left coalition. However, Yesh Atid's surplus votes ended up helping Netanyahu form his coalition without Labor after the prime minister reached a deal with Yesh Atid chairman Lapid – thus leaving Labor in the opposition. 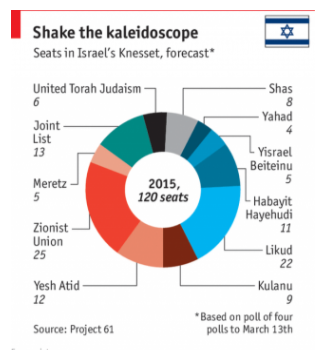 The minimum number of Knesset seats a party can hold is 4 seats – or 3.25 percent of the general vote. The threshold was put in place to prevent one or two-person parties and to encourage people to vote for larger parties or blocs. In previous elections, the threshold was 2 Knesset seats. A direct result of this new threshold is the Joint Arab list – a unified bloc of the three Israeli Arab political parties – each of which had averaged 3-4 Knesset seats in past elections and were thus on the cut-off point. To prevent a massive loss in Arab political representation, the three parties banded together. Although the move forced all three to swallow their political differences, it is expected to enhance their relative power. Ironically, the new threshold might backfire on its sponsor: Foreign Minister Avigdor Lieberman, whose Yisrael Beytenu spearheaded the Governance Law that saw the threshold rise to four seats is now polling at five seats, a massive decline since their heyday as a party of influence. The left-wing Meretz – a fixture in Israeli politics – is also hovering around the five-seat mark after the results of the Labor primaries stole their thunder. Yachad-HaAm Itanu – a Shas offshoot party led by its former chairman Eli Yishai – is currently polling at only four seats, a close call considering the poll’s margin of error. After the votes are tallied and the Knesset seats are distributed – the political game of coalition-forming begins. Putting together a ruling coalition in Israel is a delicate game of numbers and political wheeling-and-dealing between parties, who must cobble together a majority of 61 Knesset to form the government. .The heads of the different parties are invited to meet the president and each recommends one person to form the next government. The person with the most recommendations – or the best odds of gaining a majority in the Knesset – is given a mandate by the president to negotiate with the different parties to form a coalition. If they succeed, they become the next prime minister. The politician hoping to sit at the helm of the new government has 40 days to negotiate with the different parties to join his or her coalition – in return for their support, parties are offered ministerial positions, policy decisions and even a veto right. However, one party’s demands can often cross another potential partner’s red line. For example, when the last government was negotiated, religious Zionist leader Naftali Bennett secured the right to vote outside coalition lines in all issues relating to religion and state, thus clearing the way for the Yesh Atid – a secular party – to join the coalition and promote its own agenda. Should the allotted 40 days pass without a majority reached, the president repeats the process – sometimes extending the mandate to the same person or giving it to someone else. If 100 days pass without a coalition being formed, new elections are called and the entire process begins anew. For example, in the 2009 election, Tzipi Livni’s Hatnua gained the most votes and was thus selected to lead the coalition building process. However, after two attempts, Livni failed to reach the needed majority after negotiations with Shas went sour. The responsibility to form the government then fell on Netanyahu, though the Likud had won 27 Knesset seats as opposed to Livni’s 28. Parties, lists, and political blocs can run together. For example, the "Zionist Camp" is running on a joint ticket though it is comprised of left-wing Labor and centrist Hatnua. The parties can chose to remain together after the election – as was the case when Likud merged with Yisrael Beytenu during the current government – or disband into different factions – as the United Arab list is expected to do after the vote. Any citizen over the age of 18 can vote and participate in the elections, including those with criminal records. However, the voting itself takes place only in Israel, preventing expats and world Jewry from participating. Diplomats, soldiers and sailors are the exception to this rule and are allowed to vote with absentee ballots. Although rare, some parties are barred from running. The party lists are confirmed by the Israeli Central Elections Committee, comprised of MKs and a Supreme Court judge. The committee has banned four parties from running in Israel’s history; though all but one ban has been rescinded. According to the state, a list which acts directly or indirectly against the existence of the State of Israel as the state of the Jewish people or against its democratic nature; a list which incites racism; a list which supports the armed struggle of an enemy state or a terrorist organization against the State of Israel cannot participate in the elections. Yet the latest opinion polls suggest that a parliamentary election on March 17th may leave the Knesset as fractured as ever. Eleven parties are likely to gain seats. Even a grand coalition of the rivals Likud and Zionist Union, the two largest factions, would be unable to secure a majority. How did Israeli politics become so tangled? Parties have splintered, merged and changed names since the birth of the Jewish state. The fragmentation has become more acute in recent decades. Take Labour. A socialist-inspired party formed of various mergers of Labour Zionist movements, it was the main force behind the creation of the state under David Ben-Gurion and dominated the early decades of its politics. But it is in the throes of a long decline. Its great rival, Likud, traces its origins to the territorial maximalists led by Zeev Jabotinsky, known as revisionists. They dominated the Herut and later the Gahal parties even as they gained allies. Under Menachem Begin Likud ended the Labour hegemony in 1977 but it, too, is now a much-reduced force. Israeli political parties often revolve around charismatic figures. Ben-Gurion was a serial splitter. He fell out with Mapai in 1965 and led a breakaway party called Rafi. When it reconciled with the renamed Labour party in 1968, he led another splinter faction called the National List which, after his retirement in 1970, soon joined and then merged with Likud. Apart from Labour and Likud, there are seven other broad groupings. To the left of Labour lie the Zionist leftists (more willing to compromise on land), the communists (who emphasise equality among Arabs and Jews) and a spectrum of smaller Arab parties (nationalists and Islamists). To the right of Likud sits a varied and constantly changing mix of groups, often demanding harsher treatement of Arabs, be they Israeli citizens or Palestinians in the occupied territories. Israeli politics has long nurtured centrist movements (currently, Yesh Atid and Kulanu), which tend to capitalise on resentment of the big parties and focus on social change: cleaner government, for instance, or a reduction in the influence of religious parties. Indeed, the religious parties are the traditional kingmakers. Their main concern has been to maintain the dominance of orthodox Judaism in personal law (in marriage and divorce, for example), and to secure state funds for religious schools and institutions. But the religious parties are themselves split between the ultra-orthodox sects that in the past resisted Zionism and more modern nationalists (like the National Religious Party) who regard the state as a reflection of God’s will. Shas is a religious party appealing to Mizrahi Jews, who came mostly from Muslim countries. One obvious explanation for the awful fragmentation of Israeli politics is the ideological, religious and ethnic diversity of a country made up of Jews from many corners of the world. This is aggravated by the electoral system. From the outset Israel adopted a pure form of proportional representation. Over time the threshold for entry to the Knesset has been raised; parties must now win at least four seats. Israel experimented with the direct election of the prime minister in 1996 but soon abandoned the reform. By allowing citizens to split the ticket—ie, to cast votes for two separate parties—the measure made the factiousness of the political system even worse. Neither has ideological turmoil over the territories occupied in 1967 made matters easier. The National Religious Party was once a reliable Labour partner. After 1967 it embraced the religious settlement movement that encouraged Jews to live in the occupied territories, especially the West Bank, as a divinely-ordained duty. In 1976 it broke ranks with Labour, and joined the first Likud-led government in 1977. Yet the greatest cause of cleavage and counter-cleavage is disillusionment with the failed peacemaking process with Palestinians and the violence that has accompanied it. Israel has moved to the right as it has lost faith in Labour's message: that a negotiated land-for-peace agreement with Palestinians can bring a lasting end to conflict. That said, some rightists have moved leftward, embracing the idea that Israel cannot forever hold on to a growing and restive Palestinian population. The Likud prime minister, Ariel Sharon, withdrew unilaterally from Gaza in 2005. He left his Likud party and led a centrist breakaway faction called Kadima. After suffering a stroke, he was succeeded by Ehud Olmert, who won the 2006 election, reducing Likud to a rump party with just 12 seats. But Kadima itself lost its way and disbanded. Its former leader, Tzipi Livni, scion of a revisionist family, formed her own centrist party: HaTnua, which has now merged with Labour to form Zionist Union. Increasingly, then, Israeli politics has become a game of minnows. The next coalition will be a challenge to form and probably too unstable to linger long. Soon, no doubt, there will be another election, and another shake of the kaleidoscope. Now that the role of the people is over, the election will be decided by one man: President Reuven Rivlin. Jerusalem - With all due respect to the millions of people who gave up time on their vacation day to cast ballots, it was clear from the start that the election would be decided by one man: President Reuven Rivlin. When the polling stations closed at 10 p.m. Tuesday, so did the irrelevant part of the election when the people had their say. Now the important part of the election begins. Polls in The Jerusalem Post and elsewhere have found that the people of Israel do not want a national unity government. In past elections they did, but this was the “it’s us or them” election, in which everyone pushed for their own team. Perhaps now that the election is over, the people will change their minds and favor unity again. But it does not matter, because the role of the people in the election is over. It’s now Rivlin’s turn to take over, and Rivlin wants a unity government. It’s his job to bring about the strongest and most stable government, and he thinks that is a coalition of Likud and the Zionist Union together. The leaders of Likud and the Zionist Union, Prime Minister Benjamin Netanyahu and opposition leader Isaac Herzog, will push Rivlin to give them a chance without the other. But Rivlin will push back for unity. His associates say he won’t force a unity government, but he will encourage one. Anyone with a Jewish mother knows that sometimes it’s hard to tell the difference between the two. So a unity government is the most likely coalition. It would include the Likud’s 27-28 seats, Zionist Union’s 27, Kulanu’s 9-10, Shas’s 7, and United Torah Judaism’s 6-7 for a total of 76-78 mandates. If Netanyahu gets his way and receives the right to form a right-wing government, it would include the Likud’s seats 27-28, Bayit Yehudi’s 8-9, Kulanu’s 9-10, Shas’s 7, United Torah Judaism’s 6-7, and Yisrael Beytenu’s 5 for a total of 62-66 mandates. If Herzog gets the right to form a government, it’s more complicated. The haredi (ultra-Orthodox) parties say they won’t sit in a coalition with Yesh Atid, the Joint (Arab) List says it won’t join any coalition, and Yisrael Beytenu leader Avigdor Liberman says he won’t join a coalition with Meretz even if he is offered the title of president of the United States. The best Herzog could do is take his 27, Kulanu’s 10, Shas’s 7, UTJ’s 6, and Meretz’s 5. That’s only 55 mandates. That brings us back to a unity government. President Rivlin, the choice is yours. This election will be decided by one vote.